The parish was in the Denton sub-district of the Grantham Registration District. In an 1891 redistricting, the parish was put in the Grantham South sub-district of the Grantham Registration District. You can also perform a more selective search for churches in the Great Ponton area or see them printed on a map. The local Anglican church is dedicated to Holy Cross and is said to have been erected in 1519 by Anthony ELLIS. The church structure contains, however, some 14th century work. The tower was designed by Christopher WREN. The church seats 200 people. At the enclosure of common lands in 1772, about 531 acres were set aside to generate income for the church. The church was re-roofed and restored in 1871. Here is a photo of Holy Cross Church, taken by (and copyright of) Ron COLE. The Anglican parish register dates from 1622. The London Family History Centre has the parish register on microfilm for 1622 thru 1951 and the Bishop's Transcripts for 1662 thru 1834. 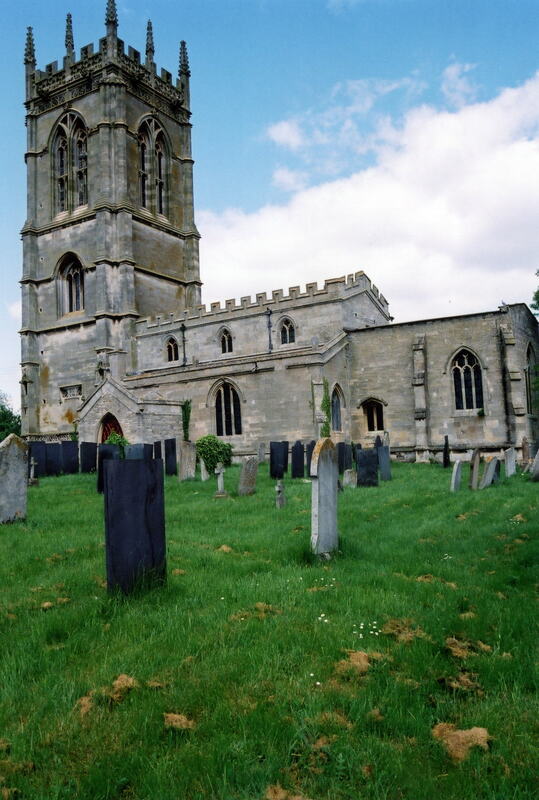 The Lincolnshire FHS has published several marriage and burial indexes for the Beltisloe Deanery to make your search easier. Around 1880, due to the growth of Grantham, the church was moved to the new South Grantham Deanery. Most family records will be found in the Beltisloe Deanery indexes (see above). The Wesleyan Methodists built a small chapel here prior to 1842. The Primitive Methodists had one by 1871. For information and assistance in researching these chapels, see our non-conformist religions page. Great Ponton is both a parish and a small village about 3 miles south of Grantham and 4 miles north of Colsterworth, as well as just over 100 miles north of London. The parish itself is bounded on the north by Stroxton and Little Ponton parishes and to the west by Wyville parish. The parish covered about 2,700 acres in 1842, increased to 2,900 acres by 1881. In 1913, the parish boundaries allowed 2,744 acres. Brian GREEN provides his photograph of the River Witham on Geo-org, taken in February, 2008. The village can be accessed off of the A1 motorway south of Grantham. The A1 passes through the western edge of the village. Ermine Street, formerly the Great Northern Road and now the B6403 trunk road, passes a mile east of the village. Ask for a calculation of the distance from Great Ponton to another place. You can see the administrative areas in which Great Ponton has been placed at times in the past. Select one to see a link to a map of that particular area. The village was occupied by the Romans, at least based on the number of Roman coins, urns, bricks, mosaic pavements, arches, etc. found in the parish. It was reportedly the "Ad Pontem" of the Romans. When the railways came in the second half of the 1800s, it bypassed Great Ponton itself. A train station for the Great Northern railway was established just across the River Witham, a mile east of the village, and given the parish name. John BRICE was the station master in 1871 and George FARR in 1881. A Miss Ann AYSCOUGH, who died here in 1633, was reportedly 114 years old. The village is famous for a violin-shaped weathervane, which has now become the logo for the village. Prior to 1842, part of the ancient Great Ponton Hall remained. It had been the seat and property of the ELLYS and ARCHER families, but had been sold to the Earl Dysart in 1793. It was a farmhouse in 1871. Alexander KAPP provides a photograph of the War Memorial in the graveyard on Geograph, taken in 2012. For a photograph of the Great Ponton War Memorials and the list of names on them, see the Roll of Honour site. The name Ponton presumably comes from the Latin for "bridge," which was "Pontus". The village name is often found spelled as Paunton, or the Latin form was used, "Paunton Magna". The parish was in the ancient Winnibriggs and Threo Wapentake in the South Kesteven district in the parts of Kesteven. The parish was also within the Soke of Grantham. You may contact the Parish Council concerning civic or political matters, but they are not staffed nor funded to assist you with family history searches. The Common Lands were enclosed here in 1772. Bastardy cases would be heard in the Spittlegate petty sessional hearings. A Free School was founded here in 1717 by William ARCHER, who endowed it with two cottages and 39 acres of land. Four more acres were added in 1773. New school rooms were built in 1874. It was formally called "Archer's Endowed Church of England School."